With the current freezing temperatures here in the UK, you could be forgiven for thinking we're in the depths of winter, months from the slightest bit of warmth, but, believe it or not, spring is on the way. In just a matter of weeks we'll be swapping our chunky coats for lighter jackets and leaving the gloves and scarves in the wardrobe. Of course, hats are a year round accessory, so they're here to stay. As the new season approaches, it's time to think about how we're going to transition our winter wardrobe and get it ready for spring. 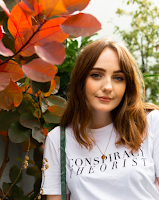 This doesn't mean go and do a massive haul from each and every store, but simply buying one or two new pieces can freshen up your entire wardrobe. Better yet, invest in pieces that will work seamlessly with the things you've been wearing all winter, like this dusky pink cord jacket. 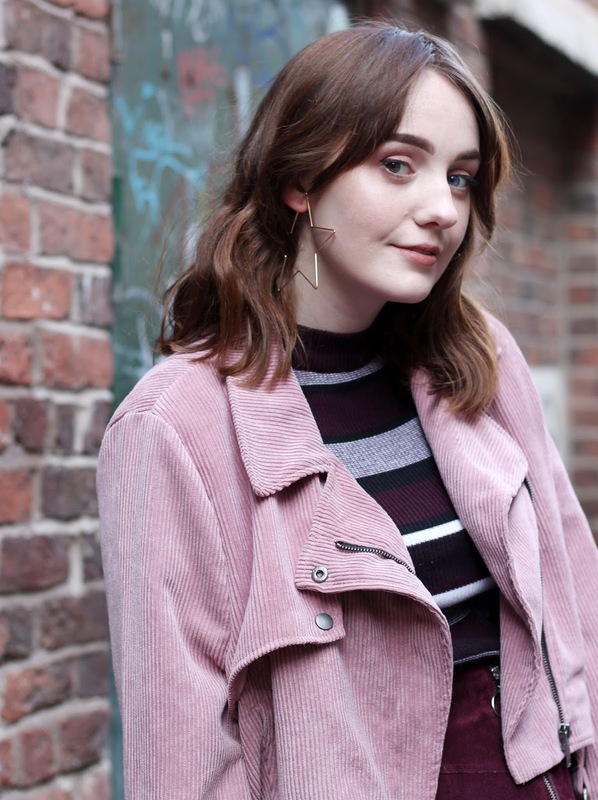 This cord biker jacket from Nasty Gal is a new addition to my wardrobe, and the dusty pastel pink colour paired with its lightweight goodness makes it the perfect piece for spring. All winter I've been rocking my faux shearling aviator because I love the shape and style, but soon enough it will just be too warm for that. That's why I'll be switching it for this easy, breezy Nasty Gal jacket. Side note - anyone else think of Monica Gellar whenever they hear the word breezy? She was ~not~ breezy. I've noted this on the blog before, and it's still true in a way.. I tend to steer clear of pastels, especially pastel pink. I'm always scared it's going to wash me out and I don't see myself as a pastel person, but spring signals the season of fresh starts, the big clean, a chance to try something new. That's why, this spring, I'll be easing my way in with this cord jacket. It may be fairly light on the colour spectrum, but the cord fabric is very seventies (tick) and the ever so slightly baggy biker shape is something I know and love. Not to mention it's universally flattering, and a fresh spin on the faux leather biker we all have in one variation or another. 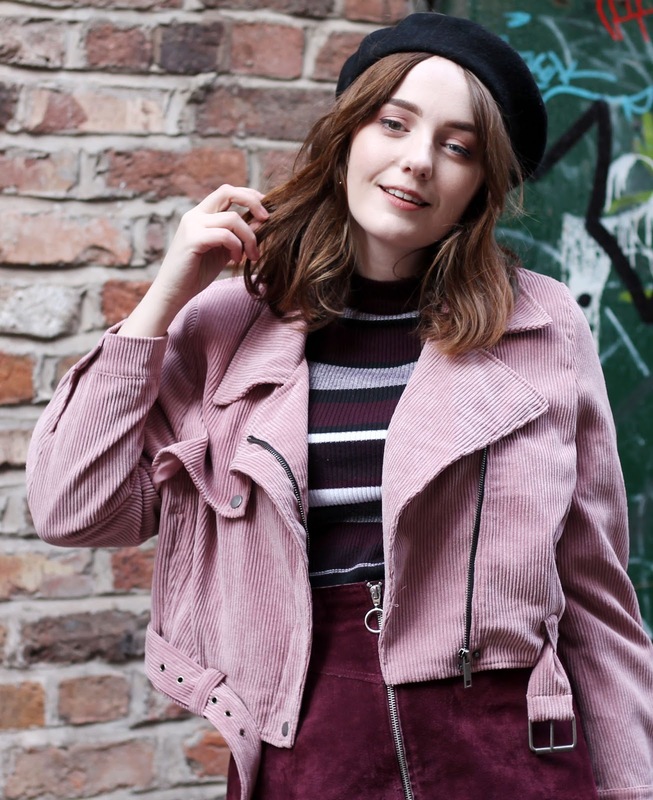 I'm really liking purples, oranges and reds at the moment, so sticking (sort of) with this colour scheme, I've paired my new pink biker jacket with a purple striped jumper I've been wearing a lot this winter, co-ordinating with this charity shop find of a skirt you've seen before. This is something else I've been wearing this winter, with black tights and these old faithful boots and a thick jumper for work. As spring approaches, I'm taking this outfit and making small changes to keep it fresh for the new season. Still not letting go of that beret though. So, who else is loving pink cord after this post? Because right now I want everything to be pink cord. From my jacket to my jeans. Everything. Aside from that, what are you excited to be wearing this spring? *Affiliate links are used in this post. Items marked with a (*) are gifted. All opinions are my own. You're killing it right now Allie! LOVE this look! I love this, you look gorgeous! I am so drawn to that skirt and it is nothing like I would usually pick up, but it's cuteness will not stop calling out to me! 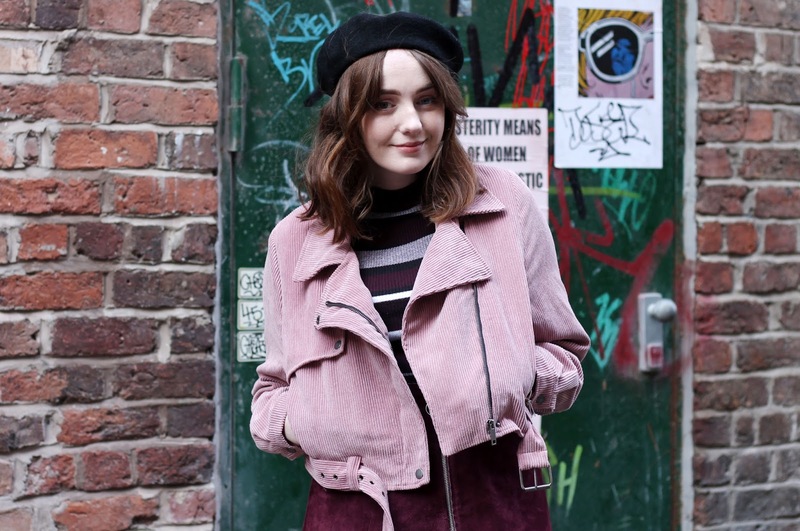 The beret, pink corduroy jacket, striped jumper and rich red zippered skirt look very attractive styled together, and your hair looks beautiful!